I like pulling out cars from way back in an automaker's history, and probably ones they'd like to forget. Every time I mention a Ferrari 412, someone in Maranello wishes I wouldn't do that anymore. I was going to pick on BMW this week with something much older than a 5-series GT, but in the process of being snarky, I became smitten. I haven't seen a BMW 501 probably since 1998, when there was one at a used car lot around the corner from my house that usually had a lot of old Saabs. The 501 was a postwar BMW effort to get restarted in the car side of the business, and this was about a decade before the New Class came along to establish BMW in carmaking. It was kind of a flop in the market, as less than 10,000 501s were ever made between 1952 and 1958, and it isn't even remembered as one of the company's finest points. Some of that lack of success has to come from the styling, which I and a (probably) small group like. The 501, called the "Baroque Angel" in a History Channel show I watched as a kid, is hard to connect to the BMW lineage now and I value it as an obscure footnote in the company's history. What if the 7-series took this design route? That's why even this rusty 1957 501 on Long Island interests me greatly. The relative rarity of the 501 sort offsets the fact it's going to be epicly slow thanks to a 2.1-liter straight-six that makes power, but not really enough to move you. What does raise flags is the $23,500 price tag, and that doesn't include the expensive restoration it's going to need to look nice. Or I could leave it this way and have paid roughly what a CPO 328i costs and, instead, look like an eccentric millionaire. As is often the case, being different isn't cheap. 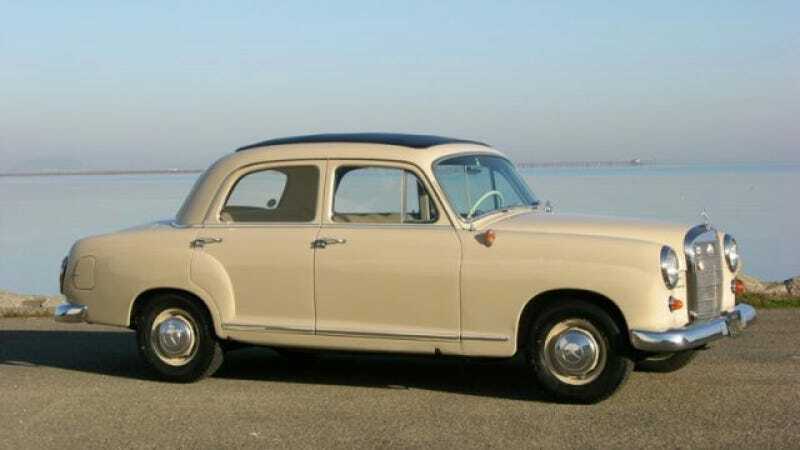 And besides, when you're talking about old German sedans, "Ponton" is a word that should always come up. It's kind of the quintessential Mercedes, the E-Class of its time. Usually these are covered in moss next to someone's garage, so a nice, clean example always turns my head. This 1960 190 going for $13,000 is painted in kind of a boring color, but the sliding fabric roof is cool and it's relatively pristine. There are fabric seats in this Benz, too – talk about basic. But at least the wood adds a touch of class and That's some reassurance since the 1.9-liter four-cylinder in this isn't going to get you anywhere in a hurry. But that isn't the point of this car. The seller says the doors open and close solidly and the shut lines look good, as they should, because this is an old Mercedes after all and it should have better build quality than a vault you store your priceless heirlooms in. It's hard to imagine the same company that made this 190 is now making small sedans like the CLA, and I find that new Benz looks kind of overwrought next to this car from a time when the model designations were simpler. Between the two, I'd have the Mercedes to drive every day. But in a fantasy world, I quite like the thought of owning that BMW because you just know you're never going to see another one going by. Maybe it's just me, but is it too crazy to even think of driving a BMW 501? Sound off.